The GXT1000XB combines the Mxt90 micro mobile 5 Watt GMRS radio with weather and Magnetic mount antenna and the popular gxt1000vp4 portable 36-mile 50-channel GMRS two-way radio in one Package. The Mxt90 features 15 full power GMRS channels and includes the NOAA weather channels with weather scan. A full Watts of power with an external Magnetic mount antenna, offers extended range capability. 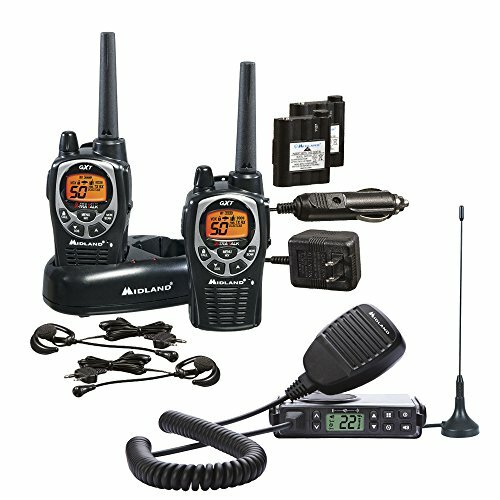 Best of all, the micro mobile provides the ability to talk to other Midland and most other GMRS two-way (walkie-talkie) radios on the full power GMRS channels 1-7 and 15-22. The mobile unit also features 142 privacy codes, Channel scan, programmable squelch, silent operation, Flip frame design to install on or under the dash with slide out removal of radio while Bracket remains mounted and a high contrast LCD backlit display for daytime or night use. The micro mobile is great for RVs, road trips, ATV/UTV activities, and on the Farm or Ranch. The popular gxt1000vp4 is a portable 50 Channel waterproof GMRS radio with NOAA weather/all hazard alert. The gxt1000vp4 features the standard 22 GMRS channels Plus an additional 28 channels. The radios meet the JIS4 standard of exposure to heavy rain for 30 minutes and features the maximum power allowed for GMRS handheld radios for up to a 36-mile range. Weather scan finds the nearest NOAA broadcast to stay up to date with the latest weather and hazard information. Features include SOS to send out a distress sound for emergency situations. The group call allows you to make "Direct calls" to other people within the group Without alerting the entire group. The gxt1000vp4 features a vibrating alert for silent notification and 9 level E vox for hands free operation. Additional features are 142 privacy codes, scan, Hi/Med/low power Settings, 10 call alerts, and battery save circuit. Midland's Dual power option allows the use of the included rechargeable battery Pack or 4 "AA" batteries (not included).